means "performed through the skin." Vertebroplasty is performed using special x-ray imaging as a guide. A small tube is inserted into the fractured Vertebra & an acrylic cement, which has the consistency of toothpaste, is injected through the tube and into the bone. 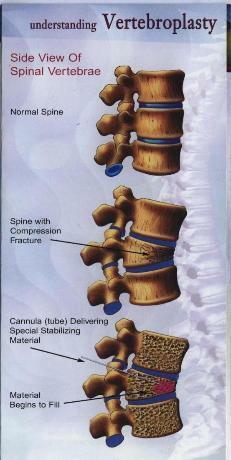 The cement hardens and stabilizes the vertebra, preventing further collapsing and reducing pain caused by bone rubbing on bone. Most patients report immediate pain relief and can usually resume their usual activities soon after the procedure.